Hmmm...I guess I didn't really have a favorite. I saw several movies, but there's not one that really stands out. In fact, I had to google to see which movies I did see in 2012! Big Bang Theory! SO funny! There are lots of great restaurants in my area. Surprisingly, I'd have to say the little Mexican restaurant that opened up in my tiny little town is my favorite. I can't even think of a new thing I tried. I gotta branch out more! A new Kindle for Mother's Day. Finished my Master's in July & then got to start reading for fun!! Is this just super adorable or what?! I think it's just precious & would be so fun to make. Maybe next year....my granddaughters are just 2...a little too young. But I love it! My favorite post is the one about my Calendar Math pack & using my students' agendas during calendar time since it's the one that has had the biggest impact in my classroom. My Calendar Math Pack actually came directly out of our Guided Math book study. I have been so pleased with the difference it has made in m students and in my math instruction. The skills from Calendar Math come so naturally for my kiddos when we come across it in our math curriculum. LOVE it! Finished my Master's in July!! Whew! Glad to get that done! WooHoo! Lovin' my little babies!! 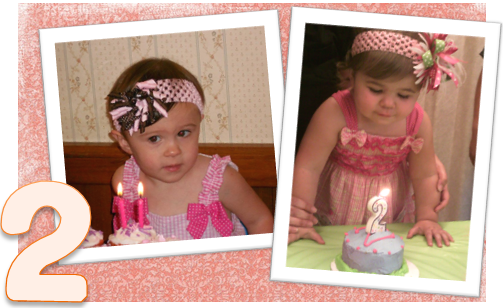 They are actually just a month apart: Baby 1 born on May 27 & Baby 2 born on June 27. What a great summer that was! And they are just such joys! I've talked so much about my own graduation, & while that was a good memory...Here's my favorite memory: My son graduated from college in May & was deep into the job search. Of course, he wanted to land a job so that he didn't have to move home, but he really, really wanted to land a job that was near his girlfriend & so that he could move toward beginning a life with her...earn money t live on, purchase the ring, etc. Of course, I prayed often & fervently for him. I remember the joy in his voice when he announced, "I GOT A JOB!!". My goal for next year is to slow down & find time to enjoy....to enjoy life, enjoy my family, enjoy my kiddos, enjoy life. Click on over to join in the fun! Share your 12 in '12! Can't wait to read what others' 12 in '12 are! So...did you hit the Black Friday sales? I LOVE starting my Christmas shopping on Black Friday. I didn't hit the early sales this year. We decided to sleep in a bit this morning. Had a great time shopping with my family. I also did some online shopping last night & this morning. LOVE the convenience! I'm feeling a bit guilty because after I got home & tallied up my purchases, I discovered I actually ended up with more for myself. Oops! Shhhh! Don't tell! Speaking of making purchases....I'm working on an Economics unit for the month of December. It's still kind of just floating around in my head, but I'm thinking PBL (project based learning) style...I'd really like my kiddos to develop ideas for & create products to actually sell. Stay tuned.....it'll be up here soon! I'm also super excited about the SALES happening at Teacher's Notebook this weekend! Woohoo! Up to 55% off! I'm already shopping around over there (see...I told you I'm ending up with more for me! LOL). I'm happy to be participating in the sale, too! EVERYTHING in my store will be 20% off. TN is also giving an additional 10% off! 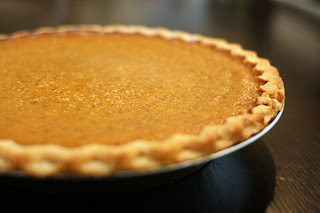 Well, my pies are out of the oven, the turkey is prepped and ready to be popped into the oven in the wee hours of the morning, & I am ready for the holidays to begin!! Over the past several weeks, I've been thinking of all the many things for which I am thankful...family, friends, health, & the ability to adjust to new situations & challenges are high on my list. I am so thankful for God's grace. My mom was diagnosed with Alzheimer's this summer, & since then it seems my life has been filled with new adjustments & new responsibilities. Learning my new "normal" & getting the school year off to a running start proved to be a challenge. But, you know what? It really wasn't that bad....things are under control...my family is healthy...my mom is doing pretty well...I love my group of kiddos...they're learning & showing lots of growth...It just hit me tonight as I sit here reflecting that even with the challenges of this year, I am truly blessed. With that being said, I am looking forward to getting back to blogging! I have really missed it. I feel blessed to be part of the blogging community. I love that there is so much support for one another. I've met some really great friends & I've really missed being here. So glad to be getting back! allows student voice & choice is integral-- Projects are developed based on students' interests & within the PBL, they should have choice of activities &/or products. involves a public audience (other than their classmates & teachers)-- Students present their work to other people, either in person or online. This component "ups the stakes" & increases student motivation to do quality work. My class was SUPER excited about it! 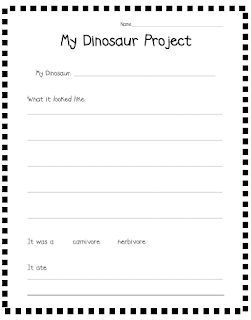 Each child choose a dinosaur to learn more about & develop their project. I gave them a Research Guide to help them through the process. (You can grab the freebie by clicking on the picture). We also typed up our research in a Voki....which they absolutely loved! 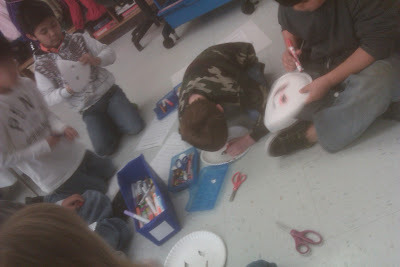 We finished up the projects on Friday, took pictures & filmed for the museum people then we took our show on the road! Dinos on parade! 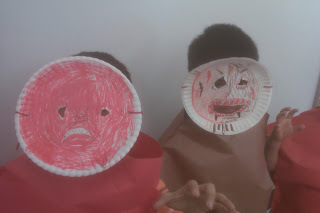 Didn't they do an awesome job creating their costumes? 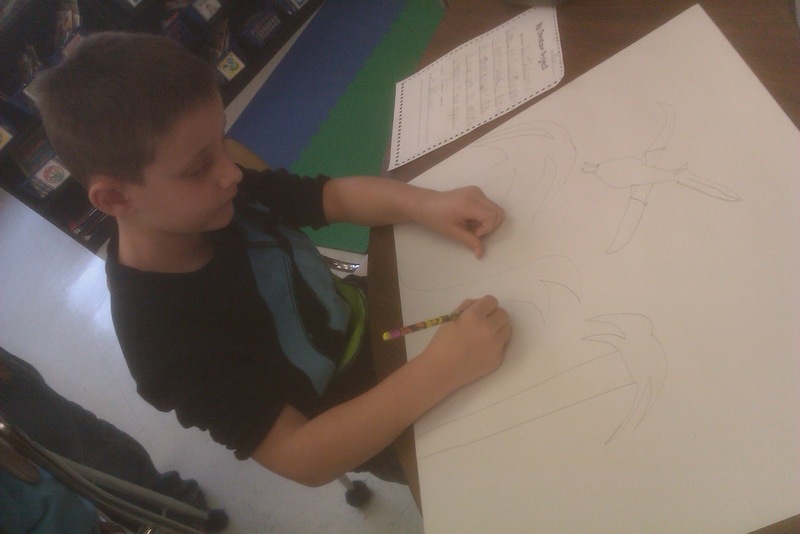 We made a dino-parade through a couple classrooms. What fun! In other news, my blog was featured this week by Carson-Dellosa as Best Blog of the Week. I am super, super excited!! I'm so excited about the Back to School Expo that's happening August 25- September 1. I love, love, love hearing from other teachers & sharing ideas about instructional strategies, management, & well...just about everything! And guess what?!? They're installing my new SmartBoard right now, as we speak!! YAY! So excited! And since I have no experience using a SmartBoard, I'm really looking forward to learning some tips! And it's an added plus that it's all online, & all at your convenience. How cool is that? In addition to the great presentations, there's also going to be a VENDOR HALL & I just heard that attendees are going to be a GOODIE BAG too! I am SO there! Do you have your ticket yet? Just click the Expo button. Don't wait too long! This deal ends Thursday the 23rd. After that, you can purchase tickets for $19.95. I am so excited! Hope to see you there! 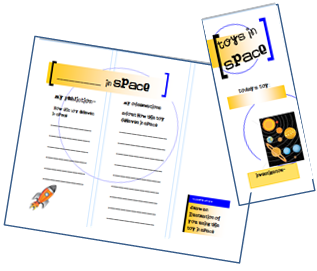 Find a way to integrate our school-provided journals into our routine. Seriously amp up my math meeting/calendar board time. 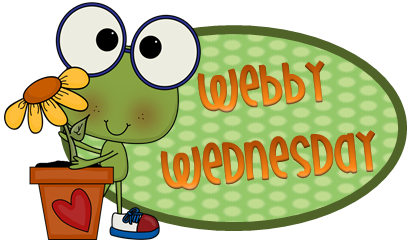 Move toward a new weekly format that is more in line with the one suggested in the book. 1. 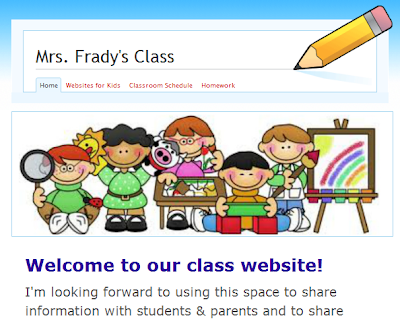 I took a look at the agendas & thought about what we could do with the. There's just not a lot of space there! I also thought about the skills my kiddos needed to work on. Time is definitely one of them. I decided to divide up the math meeting/calendar time...a little bit in the morning & a little more right before recess/lunch. Here's what I'm doing with their agendas: as soon as they come in, they stamp a blank clock face in their agenda & "make it look like the one on the board". After announcements, we write the time & indicate whether it's a.m. or p.m. We also code the date, write the number of days of school, record it in tens & ones, & decided whether it's even or odd. 2. We've also been cruising right along with our calendar journals. We've not gotten up to getting everything done each day yet....like I said, we're still polishing! We'll get there! 3. 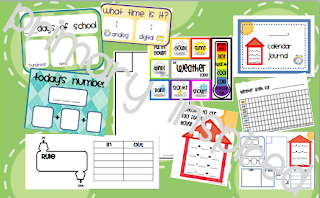 Something new to me when it comes to weekly routines is using Friday to create anchor charts & graphic organizers... I'm so excited about this! We did this on Friday & created MONEY anchor charts. I gave each of my kiddos either a coin or a label (value, name, etc). Then they had to find their matches. 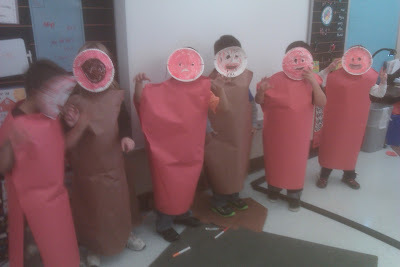 Once all the pennies, nickels, dines, & quarters were together, each group made a poster & practiced what they would say if they were teaching a first grader about their coin. I was really excited about how this experience turned out! I think it really helped several of my sweeties learn a bit more about coins. 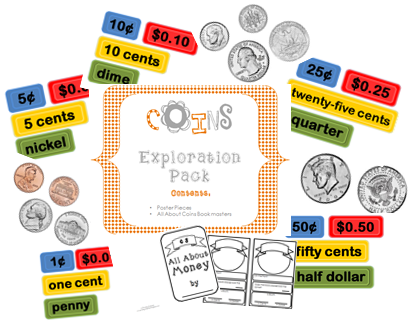 This week, we're going to extend our learning by making All About Coins books during math workstations. They'll do coin rubbings & add in information about each coin. I added this little packet to my TpT store. It includes everything you'd need to do this same activity. 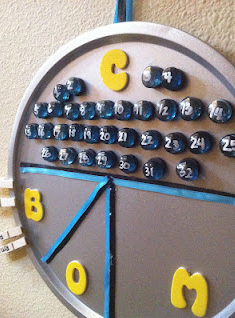 It'd also work great as a bulletin board in your classroom. I'd also like to give this away to the first 3 people to leave a comment telling me how you help your kiddos learn about money in your classroom. Don't forget your email!!! 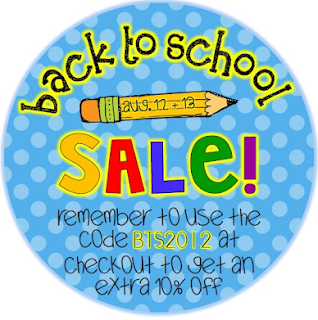 Have you already started putting things in your cart in preparation for the TpT Back to School Sale? My cart is fair to bursting! I can't wait to click purchase & start the printing!! Everything in my store will also be 20% off. Use the code BTS12 to get an additional 10% off which makes an actual 28% off. Wowie! Wow! Wow! as Junie B. would say....that's awesome. 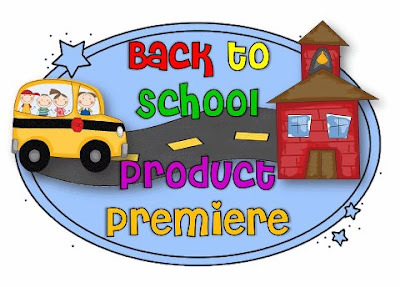 I also wanted to join in the product premiere blog hop (but it closed before I got home from school to post...bummer). But I can still preview my products for you. Lips the Fish reminds them to get their lips ready for those letter sounds. Chunky Monkey reminds them to look for chunks they know within an unknown word. And Stretchy Snake reminds them to S -T - R - E - T - C - H out the sounds. There are 5 other strategies and characters: Skippy the Frog (Skip the word & come back to it), Eagle Eye (look for picture clues to help figure out a word), Flippy the Dolphin (flip that vowel sound), Tryin' Lion (keep trying), & Helpful Kangaroo (ask for help). I also have Beanie Baby Comprehension Posters. I always use the posters (both these and the decoding ones) for mini-lessons and we post it along with the beanie baby on the wall. It's interesting to hear my kiddos suggest to a friend to "do Lips the Fish", or to "think about Jabber the Reteller" or say, "I'm just like Iggy the Inferring Iguana". My Calendar Math Pack is also 20% off. I've been using it this week-- we've already got our first week in! I'm pleased to say the routine is going well. I'll post about that early next week. And just to make the big 'ole sale even sweeter....how uber awesome would it be if you WON a $25 TpT gift card just in time for the sale?! Click over to Tonya's Treats for Teachers to find out how you can win! I'm already back to school (actually this is day 4 for me! )....but I'm definitely STILL in the Back To School Shopping mode! I am so excited about TpT's Back to School Sale! Have you heard the news? August 12 & 13, TpT is offering an additional 10% off....that's 28% off if the seller is also having a 20% off sale.....which I happen to be doing! And it's not just me! 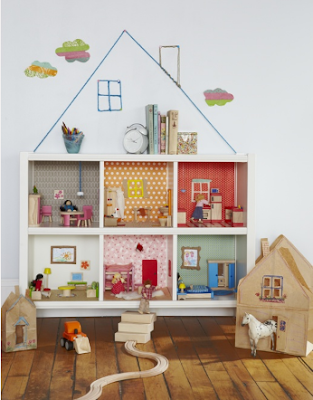 There are lots of sellers having having a 20% off sale. Want to know who all is having a sale? 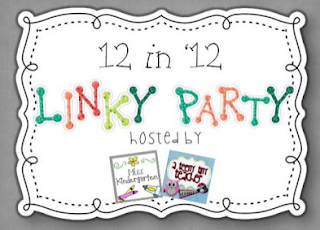 Click on over to First Grade Garden & check out her linky party. Sellers have linked their stores up & you can actually just click to their stores & check out the bargains! I can't wait!! Anyone else have a long list of items on their wish list? Made It Monday! August 6! 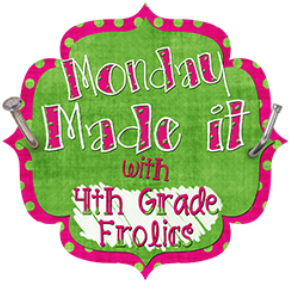 As I typed out my post title, it occurred to me that possibly my title should be Made It TO Monday! hahaha! Today is my first day back with my sweet little firsties who are now second graders. Since I loop I get to have the same crew of kiddos again this year! Yay! I have to say it does make those first day jitters much more tolerable! I got to see most of my kiddos briefly at our open house last week, but we're back in the swing of things today! 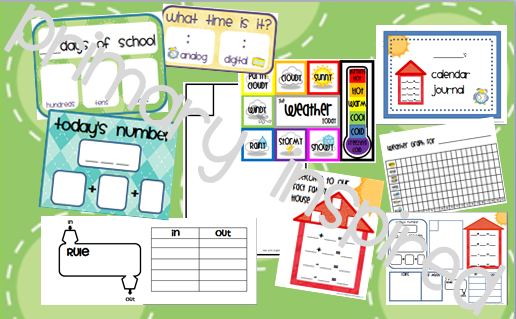 Did you see my Math Calendar Pack I posted earlier in the week? It's up & running today. I have their journals all printed & copied & ready to go! I'll be back later to tell you how it went 'for real...with real live students'! Mine is much more simple than Emily's. I got the pizza pan at the dollar store & used a paint pen to draw the lines & write the words. Hubs drilled a couple holes in it for me so I could attach the ribbon. I only have 1 magnet on right now because the others were still drying. I really, really like that the passes that the kiddos take with them are just clothes pins. I can't tell you how many passes have been lost!! Now if they lose one, I just have to get out another clothespin! #3 Mason Jar Salads - I might be silly, but I just think these salads I've seen floating around on Pinterest are gorgeous! Not to mention uber practical...I love how you can add the dressing & basically pre-assemble your salad & the lettuce doesn't get all soggy & yucky. I also love the convenience! Just assemble on Sunday night, & then just grab & go through the week! Green Plate Rule has some super awesome 'recipes' for mason jar salads. I have these yummy concoctions waiting for me for the first couple of days. (Shhh...I need to go back to the store & get some more ingredients for the rest of the week!). 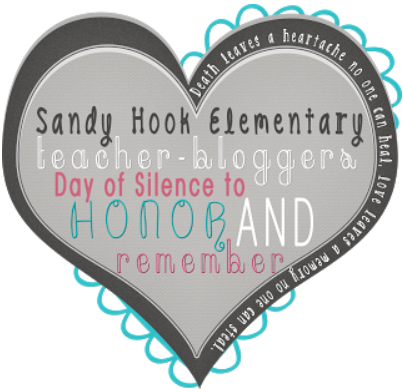 Thanks to Tara for hosting this linky...it's really been motivational! I'm off to my first day of second grade, & I'll be checking out everyone else's Made Its this evening! Can't wait to see what everyone has been up to! !